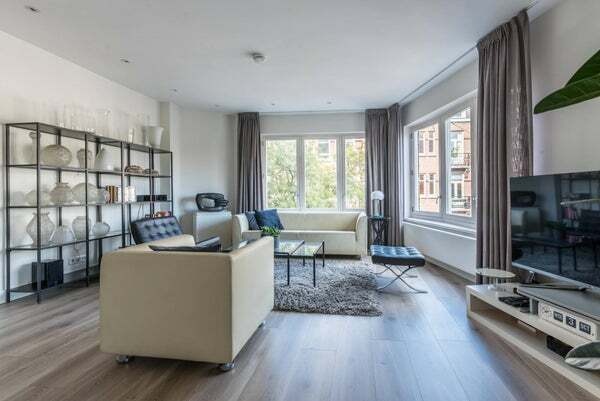 Gorgeous and luxurious two bedroom, two bathroom apartment with balcony overlooking the Cornelis Troostplein in de famous "de pijp" area. Please note only couples and singles may apply, no sharing. The apartment is located on the second floor and one enters the apartment into a hallway connecting the various rooms. On the East side there is a large open plan living with kitchen and a balcony overlooking the square in front of the apartment. The kitchen is equipped with all modern appliances. There are two bedrooms, one master bedroom on the Cornelis Trooststraat side and a second guestroom facing the interior gardens of the block. Both bedrooms have a luxurious bathroom en-suite, the master has a bath tub, the guest room a walk in shower. When applying for viewings or more information please specify desired start date and length of contract as well as other items of note. This apartment cannot be shared.